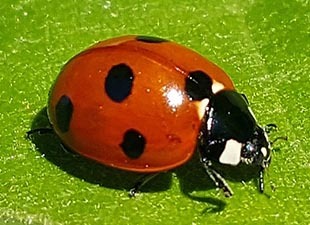 The Asian Lady Beetle (ALB) is an introduced pest in America. This non-native species was brought here to control certain parasites on crops and has simply gotten out of hand due to the fact that it has no natural predators here. 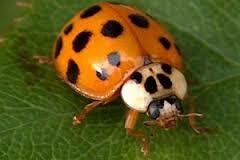 ALB is larger and more orange than our traditional, cute, bright red and most of all occasional “Lady Bugs”. They congregate in very impressive numbers on the warm southern sides of our homes in the fall and as they seek safe places to lay eggs for next year by crawling all over the house they find ways in, usually under the edge of the siding at the foundation or at the roof line. Once inside the walls, they will lay eggs in a warm place and die. When the new young hatch in Spring they will repeat the cycle as it seems that ALB, like salmon, often return to the same place they were born to lay their own eggs. In the fall or as they hatch in the spring, they can become evident in large numbers indoors. It is important that the homeowner not try to sweep them up as this will frequently result in them being crushed causing staining to furniture, walls, and carpets. In large numbers, this can also cause an odor. It is always best to vacuum them up. Because the cycle from cause to effect is so protracted it is necessary to think about ALB control as a long-term program rather than a one visit solution. ALB must be controlled via repeated services so as to reduce the numbers coming in during the Fall, and then once again reduce the numbers surviving the hatch in the Spring, and often to repeat this treatment cycle for several years in a row. This is done mainly by applying a repellent pesticide each Fall and a non-repellent pesticide each Spring. Repellents help keep the insects from approaching the house while the use of a non-repellent avoids trapping them inside. In some cases we may apply liquid or dust materials into things like window sash openings and around electrical receptacles, if the infestation warrants it.